This Malaysian Classic was my late father’s favourite curry and with good reason, it is simply delectable! The überkind of Nyonya cuisine, Kari Kapitan is the prefect confluence of traditional Malay and Chinese flavours. My version of this curry is a loose adaptation of that of the reigning queen of Nyonya food, Pearly Kee. Nyonya cuisine is the epitome of what makes Malaysian food great; inclusivity, and Pearly is a true vanguard of this culinary heritage. The result of a marriage of Malay and Chinese ingredients and flavours, Nyonya style cooking is unique to Malaysia and is, perhaps, one of the most underrated cuisines in the World. 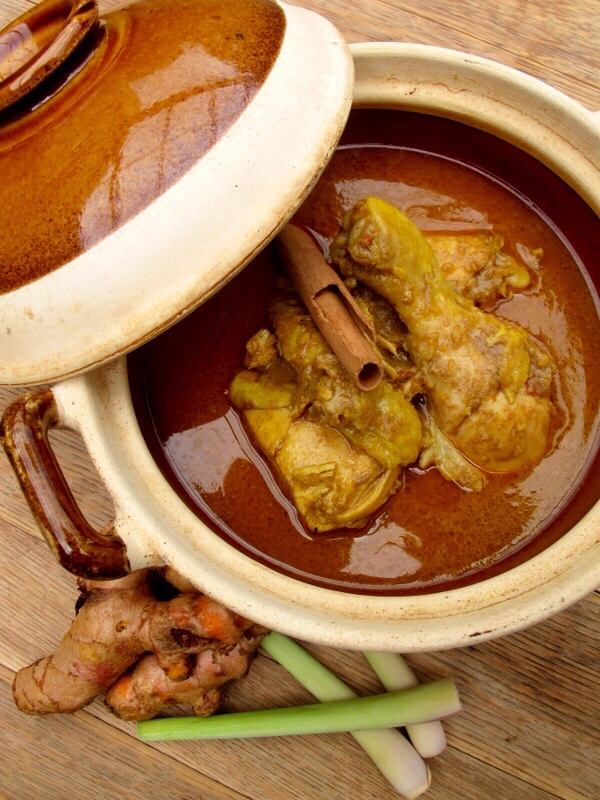 A Malaysian take on a traditional Indian Chicken Curry, Kari Kapitan is the result of a thorough Nyonya makeover. Along with the classic additions of lemongrass, lime and galangal, the chief Nyonya element is belachan. Ubiquitous to Malaysian cuisine, belachan is a fermented shrimp paste and is one of the hallmarks of Nyonya cooking. Whilst best described as ‘pungent’, belachan mellows when added to a curry, imparting a depth of flavour to the finished dish like no other. One of my happiest childhood memories is going on a family outing to the local waterfalls; virtually the entire Clan was there – grandparents, aunts, uncles and a full gaggle of cousins. After hours of slip-sliding through the falls, it was finally lunchtime! As we gathered for our picnic, my grandmother presented us with a massive white Tupperware, filled to the brim with leftover Kari Kapitan. Armed with anticipation and slices of fresh white bread, we all tucked in; what bliss! Perched on those boulders, surrounded by my army of screaming cousins, with the cool waters rushing between my toes and my fingers stained yellow from the Kari Kapitan; it was the perfect childhood memory, matched with the perfect meal. Universally, all curries benefit from a day of rest before being served, but this is especially true of Kari Kapitan. Whilst still delicious when eaten on the day of cooking, a bit of patience reaps its own reward. Such is its plethora of flavours, Kari Kapitan needs time to find its balance, to develop and mature. As a result, Kari Kapitan makes for amazing leftovers…and memories. Place all the spice paste ingredients (except the ground turmeric) into a mini food processor with a splash of water and grind into a smooth paste. Reduce to a medium heat and simmer (uncovered) for 20 minutes, or until the chicken is cooked through and tender. The oil will separate from the sauce, don’t freak out – that is meant to happen! As you can see, I’m working my way through your recipes…I made naan bread to go with this meal…delish! This is definitely one of my favourites! Great idea to eat it with some naan bread.